The Scottish Borders region lies unsurprisingly on the border between England and Scotland. To the south lies Northumberland, to the west Dumfries and Galloway, and to the north Edinburgh and the Lothians. Family run 4 Star traditional Scottish farmhouse B&B. Sleeps 12. Offering a relaxed and homely atmosphere with log fires and beautiful guest rooms. Stunning surrounding views over the rolling Scottish Borders. 5 miles from Peebles. The Borders is rich in history and heritage being the region where most of the historic conflict between the Scots and the English was enacted. At times it has been extremely wealthy giving rise to a multitude of castles, religious foundations and great houses. The scenery and wildlife are outstanding, and the roads, hills and beaches are quiet enabling you to relax in peace yet access is easy. We are always updating this page for the Scottish Borders region. If you would like to contribute material or pictures to this, please email us. In the meantime, please just click on the links below for the full range of holiday accommodation, from high quality hotels near The Scottish Borders, to nearby The Scottish Borders bed and breakfasts and guest houses. 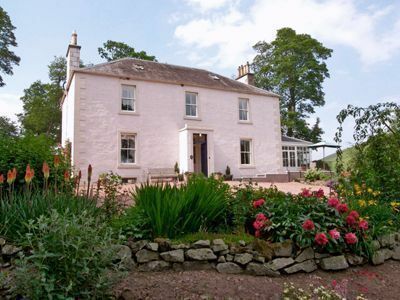 There are also a good range of self-catering cottages around The Scottish Borders. There is a wide range of attractions, places to eat and other activities to suit all tastes in and around The Scottish Borders. The friendly racecourse in Kelso, Scottish Borders. Flat and hurdles.